Ghana, Nigeria, Liberia, Sierra Leone. In a bleak partnership, privation and natural resources like gold or oil go together in West Africa. It was economist Paul Collier who first identified what he called the “resource curse.” It was his analysis of the paradox of plenty that led me to focus on Bonsaso, a remote town located in the Western Region of Ghana. What struck me most about this town was the level of deprivation and impoverishment. The young men who could not withstand the laborious task of small-scale mining had all abandoned their home in search of elusive jobs in the major cities. Left behind are elderly and recalcitrant small-scale miners determined to plunder land, water and vegetation to earn a living. The government of Ghana ordered a ban on small-scale mining in July 2017 and deployed a task force of 400 security personnel to enforce it. “The activities of the military task force have put a strain on our work. These pits you see have all been abandoned because of the military presence in the town,” my Chinese host stated as he ushered me into his motel in Bonsaso. Chan, as he is referred to among his friends, is a facilitator in the gold smuggling business. “Over the last four years, we have shipped close to 500 kg of gold, which is over US$20 million to UAE. The trade has always been very profitable until recently,” Chan disclosed. 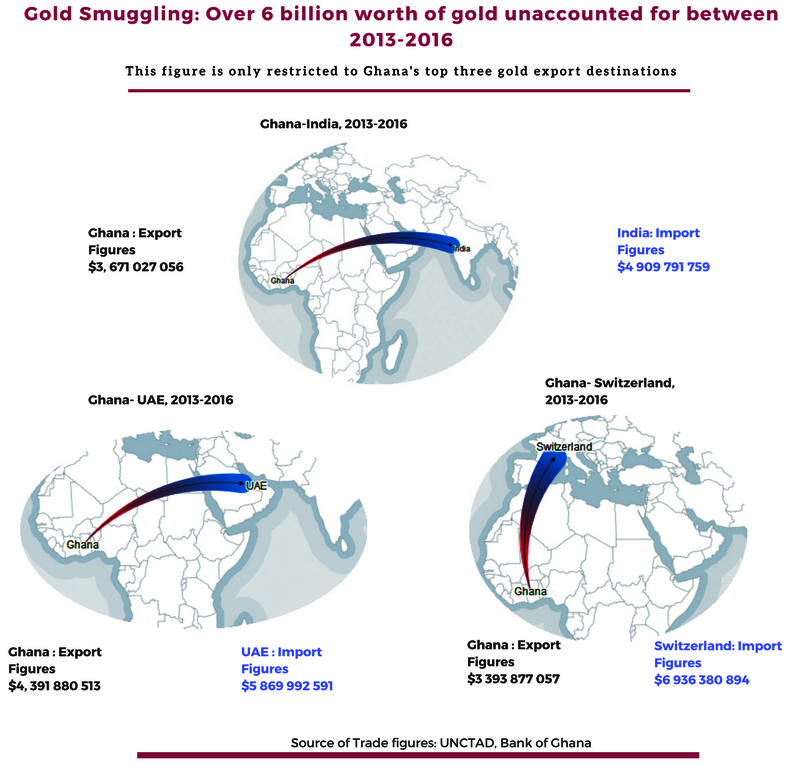 An assessment of the trade data between Ghana and its three major gold trading partners—Switzerland, India and the United Arab Emirates—revealed that over $6 billion worth of gold exports remains unaccounted for from 2013 to 2016. The figure is expected to rise significantly if all export and import data between all of Ghana’s gold trading partners were to be examined. For example from 2013 to 2016, the gold import-export variance between Ghana and Switzerland amounted to over 3 billion dollars. While Switzerland gold import figures revealed that they had imported close to $7 billion worth of gold from Ghana, Ghana’s official records indicated an export of a little over $3 billion. Mr. Opare Hammond, the current boss of the Precious Minerals Marketing Company (PMMC) blames smuggling by foreigners. “There are a lot of foreigners who are not supposed to be part of the small-scale sector when it comes to gold, but we are told that many of them have found themselves right in the towns where we do mining,” he said. Meanwhile, the Treasurer of the Association of Gold Exporters, Dr. Abu Grant, has blamed the previous board of the PMMC for its role in the loss of revenue from gold exports. 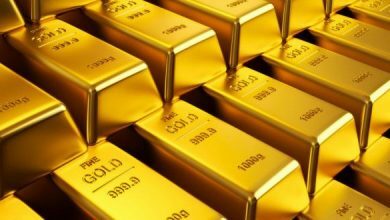 The Bank of Ghana suspended the PMMC from directly shipping gold out of the country after it was discovered in 2017 that the body was unable to trace documents surrounding over $2.3bn in gold export. This resulted in failure to repatriate at least 80 percent of foreign currency earned from exports back to Ghana. “There is no record to indicate that [any money was returned]. 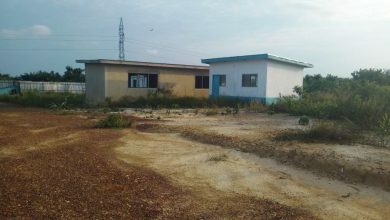 In fact, the Bank of Ghana is still on us asking for more information that will help them to even find out where these companies are, so that at least they can ask them to come and pay what they were supposed to pay…Unfortunately, many of them have not been traced,” director of PMMC, Hammond revealed. The government ordered the Criminal Investigations Department (CID) to investigate the improprieties; the probe to date has not yielded any results. 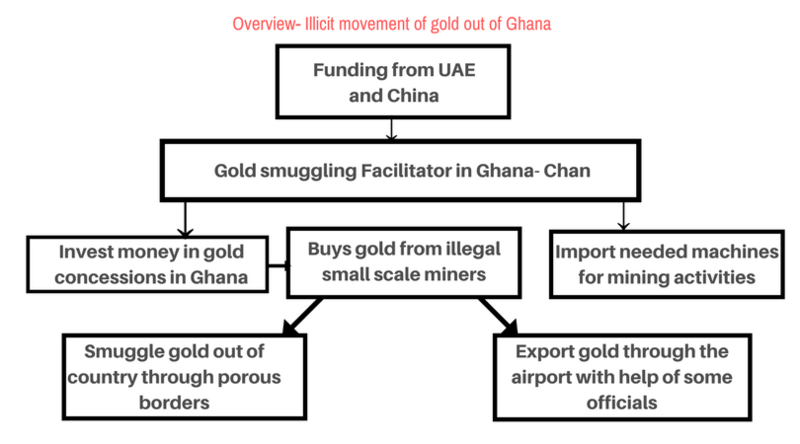 Chan, who has no legal permit to buy gold, is member of a larger network of foreigners scattered all over gold mining communities in Ghana who engage in this illicit activity. He gives a general overview of his operations as a facilitator in the illicit export of gold. As a facilitator, Chan is mainly responsible for procuring the gold locally and exporting it. To avoid paying the required taxes, he employs two main strategies during export. The first method involves smuggling of the consignment through Ghana’s porous borders to neighboring Ivory Coast where the taxes are relatively low. The second method involves bribing government officials at the PMMC and the ports to under-declare the amount of gold being exported. “After we have enough consignment to move out, which is usually between 50-150 kg, we contact our people at the PMMC to ‘assist’ in the shipment. If the system is such that they cannot help, we move it through the border to Ivory Coast,” Chan revealed. This pattern was confirmed by Isaac Kojo Abraham, spokesperson for the Minerals Commission in Ghana. Mr. Abraham also revealed that the commission had received numerous reports of smuggling taking place at the ports, and indicated that an independent investigation was being carried out by an external body. 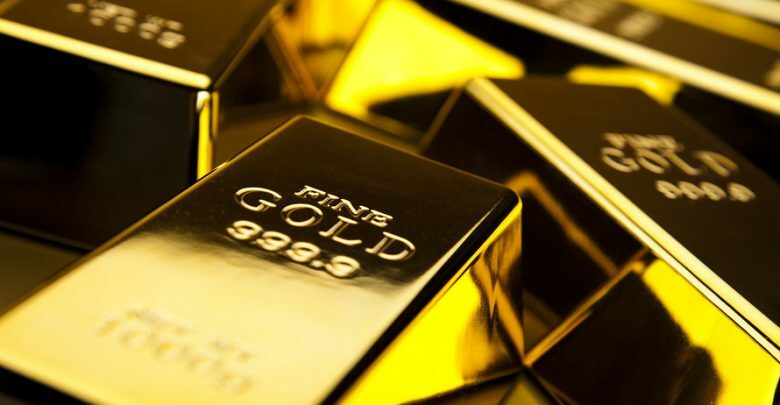 Gold exporters in Ghana are required to pay a 3 percent withholding tax to the Ghana Revenue Authority (GRA); 0.5 percent to Minerals Commission for the Small-Scale Mining Sustainability Fund; and a 0.118 percent tax to the Precious Minerals Marketing Company. Kwabena Asante Asare, Chairman of the Association of Gold Exporters, Ghana, has blamed the high tax rate as partly the reason why the smuggling business thrives. “All small-scale miners and others export their gold through us and so it is easier to monitor us than the illegal small scale miners; and so, the 3 percent tax is scaring them away and encouraging smuggling,” he stated. Ghana loses over $2 billion annually in unpaid royalties and taxes on gold smuggled out of the country according to Isaac Karikari, a director at the Ministry of Lands and Natural Resources. According to a 2016 Global Financial Integrity report, illegal mining across the world is worth $12 billion to $48 billion annually. The harm done to Ghana and other developing countries by illicit financial flows demands attention and work toward solutions, in both the developing and developed world. 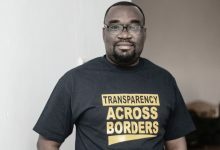 Tax expert Ali Nakyea has called for stricter controls on the part of exporting countries and harsher punitive measures to help deal with illicit financial flows. 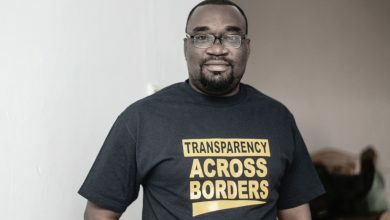 “The various causes of illicit financial flow, trade mis-pricing, bribery and corruption and transfer pricing, are areas we should pay attention to so that we get enough to ensure that our tax system works,” Ali Nakyea added. According to Chan, he has invested a little over $3 million in gold purchases, buying mining concessions and procurement of heavy earth-moving equipment in Ghana from 2014-2016. Those funds came from stakeholders in China and the UAE, he said. Over the last five years, more than 4500 Chinese nationals have been deported from Ghana as a result of their involvement in illegal small-scale mining activities according to Ghana’s immigration records. Major Gariba Adams Pabi, the Public Relations Officer of a Joint Police and Military Unit tasked to enforce a ban on small scale mining in Ghana indicated that in 2017 alone, out of 451 illegal small-scale miners arrested, 61 were Chinese nationals, the largest national group involved in illicit mining in Ghana. Despite the a ban on small scale mining, an introduction of PMMC audit units at the various mining companies, and a new assaying point at the Kotoka International Airport, Dr. Steve Manteau, Director of the Public Interest and Accountability Committee (PIAC) still believes more can be done. Manteau recommends that the regulatory bodies conduct a forensic audit in conjunction with Ghana’s trading partners to identify and address loopholes in the monitoring and taxation regime. Top officials of the GRA who spoke to me on condition of anonymity revealed that there is no broader inter-agency strategy or approach in place to address the challenge of gold smuggling and loss of revenue to the state. A proposal by GRA officials to issue Certificates of Origin as a way of tracking direct gold export from Ghana, re-export and transshipment of gold from neighboring countries does not appear to have been discussed at the inter-agency level. “The last time there was an inter-agency meeting specially designed to deal with gold smuggling was in 2012,” spokesperson for the Minerals Commission, Isaac Kojo Abraham confirmed. In 2016, total gold production figures released by the Ministry of Lands and Natural Resources was 3,754,668 (OZ) while the figure released by the Minerals Commission in the same year was 4,243,384.48 (OZ). This underscores the fundamental defect in the current structure of cooperation between these state agencies. Dr. Isaac Bonsu Karikari, a Project Director at the Ministry of Lands and Natural Resources in charge of the implementation of the Multi-Sectoral Mining Integrated Project (MMIP), also confirmed this view. The MMIP is a regimented policy framework launched by the new government in 2017 designed to adopt a multi-stakeholder approach in dealing with the illegal mining menace in Ghana. “There has not been clarity and focus of direction regarding the institutions” trying to curb illegal mining and gold smuggling, Karikari said. The buck is passed among other state agencies as well. When officials of the GRA were asked about the role of Ghana’s trade representatives in oversees embassies in the fight against gold smuggling, I was directed to the Bank of Ghana. 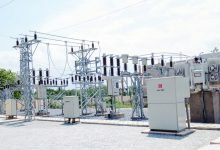 However, top Bank of Ghana officials are on record saying this is the function of PMMC and the Minerals Commission. Representatives of those bodies in turn referred me to the GRA and Bank of Ghana for queries on anti-smuggling measures. Chan’s downstream operations have been dealt a heavy blow after a third of his mining equipment was seized by the anti-illegal mining task force, but a review of gold production figures before and after the ban was instituted revealed only a minimal drop in total gold production. According to figures provided by the Minerals Commission in 2016, total gold production by small scale miners was 1,654,919 oz, representing 39 percent of total gold production in Ghana. Meanwhile, 2017 gold production figures by the small scale sector was 1,393,395 (OZ), representing 33 percent of total gold production and a drop of only 6 percent . History has shown that militarized solutions are not the best approach to dealing with this challenge, Karikari argued. 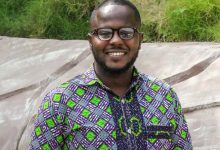 “President Kuffour and President Rawlings both introduced security task forces during their reigns but it failed to produce results because the security officials ended up being compromised by the illegal miners,” he added. “In the end, we are committed to inviting all stakeholders to join in developing a joint road map for the president. The five-year Multi-Sectoral Mining Integrated Project (MMIP) is an overall strategy that the government believes will curb illegal small scale mining, provide alternative livelihoods and bring down gold smuggling. We need everybody onboard,” Karikari said. This story was produced by iWatch Africa. It was written as part of Wealth of Nations, a pan-African media skills development programme run by the Thomson Reuters Foundation in partnership with the African Centre for Media Excellence. More information at www.wealth-of-nations.org.